For many, a busy mind makes sleep elusive. Once the lights go out, fears about the future, regrets from the past, and everything else in between keep the wheels spinning. Experts say that good sleep habits are the first step toward an easy transition to dreamland. But if you are already practicing the basics (not consuming caffeine or alcohol too close to bedtime, not napping during the day, and winding down before bed), and you still can’t fall asleep, valerian may help. Valerian is one of the best-known herbs for insomnia. It was used to help the ancient Greeks fall asleep, and it remains a popular sleep aid throughout Europe and North America. The plant has feathery leaves and a tall stalk topped with a cluster of small white and pale-pink flowers that last all summer long. The favored medicinal part is the root, which is harvested in early autumn. 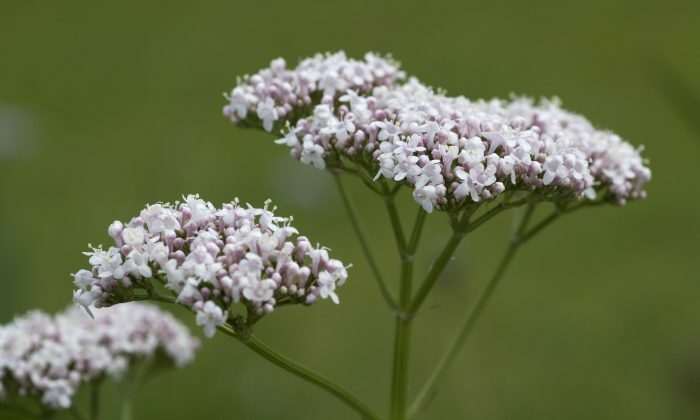 The name valerian comes from the Latin “valere,” which means “in good health,” but the herb also has close ties to a Roman emperor of the same name. Publius Licinius Valerianus, who ruled from the year 253 to 260, was apparently so fond of this sedative root that he heavily promoted it throughout the empire. Some studies show that valerian helps people fall asleep faster and get better quality sleep. Commission E, Germany’s regulatory agency for evaluating medicinal plants, approves the herb for treating restlessness and sleep disorders characterized by nervous conditions. While the most extensive research on valerian validates its effectiveness for sleep, the herb has several other uses worth considering. Valerian is an herb that helps relax the central nervous system. 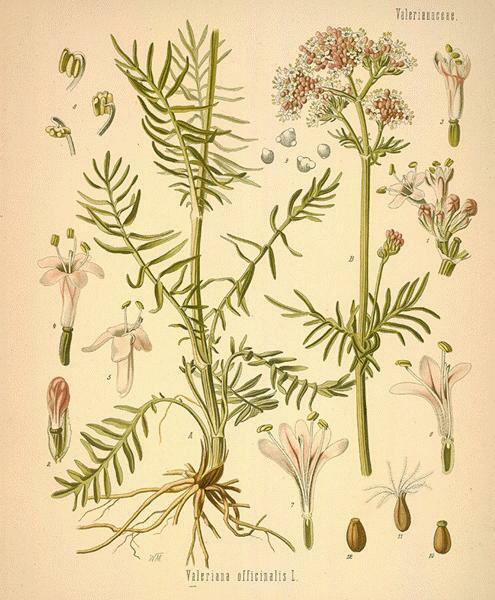 To the herbalists of ancient and medieval Europe, valerian was a remedy for heart palpitations and epilepsy. During World War I, the herb was used to treat shell shock—known today as post-traumatic stress disorder (PTSD). Today, herbalists call on valerian’s calming nature to treat people suffering from anxiety and panic attacks. Researchers believe that valerian’s sedating nature works by raising levels of gamma-aminobutyric acid, a neurotransmitter in the brain that helps calm an agitated mind. The same action is found in benzodiazepine drugs such as Xanax and Valium, but on a much stronger scale. A big problem with benzodiazepines is that they can lead to dependency. Preliminary studies show that valerian may help mitigate the symptoms of benzodiazepine withdrawal. Valerian was an official drug in the U.S. Pharmacopeia until 1936 but was phased out as modern medicine began to favor synthetic sedatives. Valerian relaxes not only the mind but also the body. The herb is an anti-spasmodic that is particularly useful in addressing nervous headaches and stomach pain. Valerian is not related to opium, but does have similar sedating properties. It is not addictive and has actually been used to help overcome opioid dependence. Valerian is not only an oral pain reliever, it can also be used topically. A valerian bath can soothe sore muscles and help one relax before bedtime. Valerian is a well-tolerated herb with a long track record of safe use. However, according to the National Institutes of Health, children younger than 3 should avoid it because the possible risks have not been evaluated for this age. There is evidence that valerian may be been used to treat children with attention deficit hyperactivity disorder (ADHD). It may seem like a contradiction, given that valerian is such a calming herb and conventional treatment calls for stimulants like Ritalin to treat ADHD. However, in a German study in which 120 kids with ADHD were given valerian extract over the course of two weeks, 75 percent showed significant improvement in learning, behavior, mental function, and clarity. Another study from 2014 found that kids who were given an extract of valerian root and lemon balm showed improvements in concentration and in negative behaviors like hyperactivity and impulsiveness. Cats are especially fond of valerian, sometimes preferring it catnip. To feline physiology, the herb is not a sedative but rather a stimulant, and it can make cats more playful or even aggressive. Some humans also experience an opposite effect with valerian. Though most people find a few hundred milligrams of valerian calming, some individuals experience a caffeinated, jittery feeling from the herb. It can also cause stomach pain, nausea, and headaches—the same symptoms that other people use the herb to treat. Personal temperature may have something to do with this opposite phenomenon. 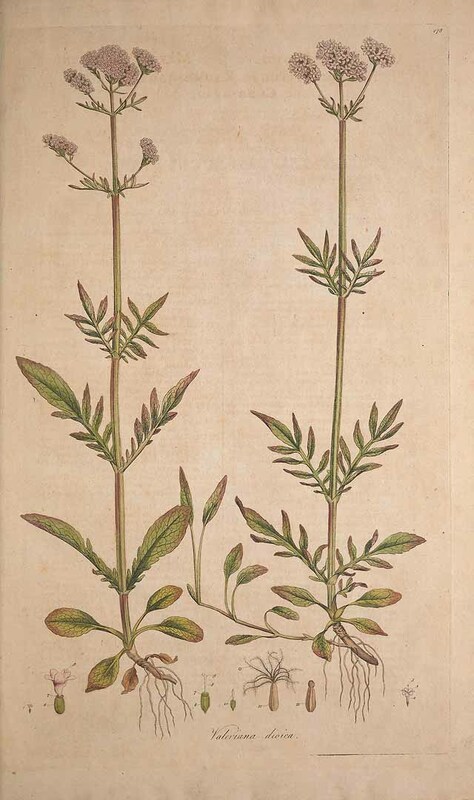 In his book “Planetary Herbology,” herbalist Dr. Michael Tierra explains that valerian is a warming herb that can exacerbate symptoms for people who are already too hot. There are many valerian species, but Valeriana officinalis is the best researched. You can choose among various pills, powders, teas, and tinctures. Standardized supplements boast up to 0.8 percent valeric acid. While this is an indication of a strong extract, researchers are not clear about all the active constituents. At standard doses (200 to 900 milligrams taken one to two hours before bed), valerian’s sleep effects typically don’t carry over into the next day. But higher doses can make for morning grogginess. To avoid this, aim for the lowest possible dose necessary to fall asleep. Consult a qualified herbalist before taking valerian, especially when using the herb for drug withdrawal. When combined with narcotics and other sedatives, valerian can amplify the sedative effect.